Can mice eat chick feed? Is chick feed a good treat for mice? I didn't think of the safety, and I gave both Biggy and Grayson a small crumb of chick feed crumble. They loved it! I am now wondering if it's safe for an occasional treat, because I've never bouget them treats, and I am a supporter of natural ingredients for treats, so I thought that the feed could make a good treat. Any thoughts? Re: Can mice eat chick feed? You would need to know what was in it to know if it was safe... What are the ingredients? What Anon said - would need to know the ingredients. your mice are NOT wild. I think giving mice foods meant for other critters can give them the runs, as I'd given my first mouse, Daniel (my avatar picture), a piece of hamster food one time...and I'm thinking it gave him the runs.. 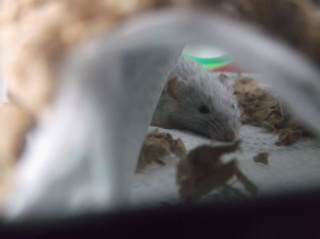 But then again, every once in a while, my mice will do an occasional runny poop, so, don't know for sure. But a different one of my mice would help herself to my ferret's food, and my ferret has a high quality food with a high-protein percent (and I think chicken, especially chick, feed has an even higher percentage), and I think that killed her. She was a bit abnormal-looking, but then again, no one person looks alike, either; and she was super active, and one day I got home and later on, I looked in her cage, and she was lying there, dead. It was a big shocker for me, especially since I'd just recently lost Daniel (aka Danny) from a terrible circumstance. Blessed are the undefiled in the way, who walk in the law of the LORD. Blessed are they that keep his testimonies, and that seek him with the whole heart. - Psalms 119:1-2. @Blessed wrote: I 'strongly' advise against it. Mice are not supposed to have food meant for other critters. I get wild mice may eat anything, but keep in mind, [i]your[i] mice are NOT wild. I think giving mice foods meant for other critters can give them the runs, as I'd given my first mouse, Daniel (my avatar picture), a piece of hamster food...and I'm thinking it gave him the runs.. But then again, every once in a while, my mice will do an occasional runny poop, so, don't know for sure. Hi Blessed, I used to have a ferret years ago. His name was Otis. He was such an awesome boy and all these years later I still miss him. He was perfect. Hi. =) Aw, I'm really sorry. My ferret is a total sweetheart. My mom's...not so much (in my opinion). 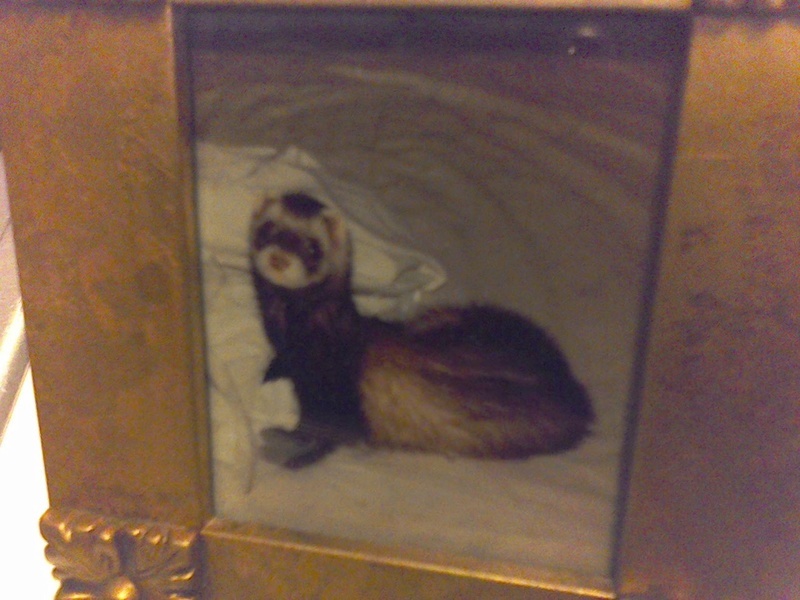 Can you share some photos of your ferret so I can see her? 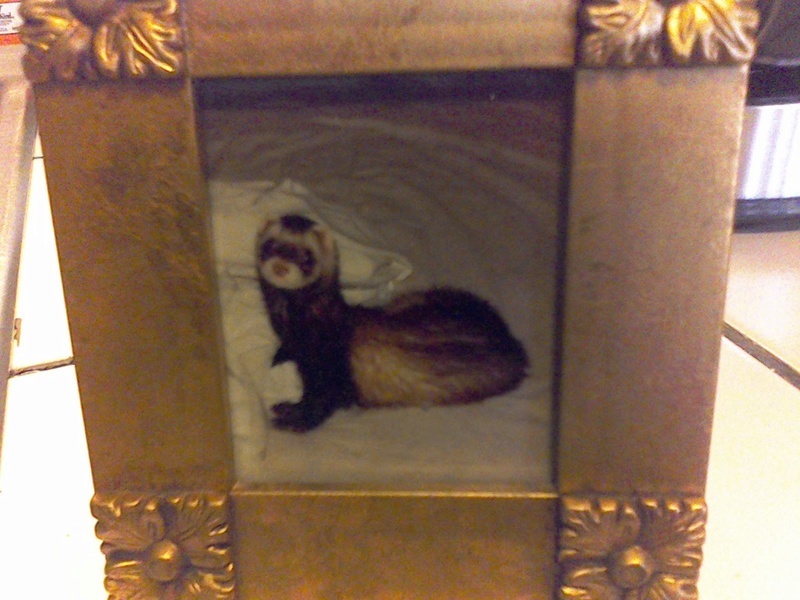 I had my ferret, Otis, back when I was in my 20's and now I'm 52 and I still keep a photo of him in my living room. Here is Otis, I took a photo of the photo so you could see him! Certainly! Your Otis is beautiful, and so, so adorable! My mom would absolutely love him, as that's her favorite color on ferrets. I like males since they're bigger, but my mom said a flat-out no to a male, as she thinks they stink more. But I'm not certain on that. What do you think? I also think it depends on the food, and how often or not you give them a bath (four times a year I think is sufficient), but both the ferrets have a high-quality food, and yet my ferret has a WAY stronger smell than my mom's ferret. My mom's fuzzy doesn't even smell too bad, but Grace, my ferret, at times has a highly offensive smell resembling a skunk, lol. =P But I love her anyways (just not her smell). And I'll make a different thread titled 'Ferrets' to share a picture, as I don't want to get off-topic here from Mice Are Cute's original post, lol.